Elder Care Professionals of Sonoma sponsored a table at the North Bay Annual Alzheimer’s Education Conference for Family Caregivers and Professionals, on Thursday June 23, 2016. Shown here are members sharing elder care services with program attendees and clients. The North Bay Offices of the Alzheimer’s Association presents its tenth annual education conference in Sonoma County. This day-long conference is designed for family members and professionals who will be updated on the latest advancements in Alzheimer’s research, caregiver resources and tools and ways to increase the quality of life for both the person with the diagnosis and their care partner. We hope that you will join us for this outstanding program. We recommend dressing in layers as the temperature in the conference venue can vary from room to room. Full refunds are granted if a request is made in writing by mail or email to the Alzheimer’s Association (sdombroski@alz.org) at least 48 hours prior to the conference. No refunds will be given after Friday, June 10, 2015. If you want to give your mom (and her care givers) a quick and easy boost, reorganize her clothes closet. Do this for your mom, then do it for yourself. When I move an elder, I always try to find time to redo the clothes closet. This helps them find their clothes more easily. Getting dressed each day is not such a chore and can become great fun. The very first thing I do is get rid of all the wire coast hangers. They are the worst! Most cleaners will recycle them for you. Then I put like things together in categories: all the pants, skirts, dresses, long dresses and robes, sweaters, short sleeve tops, long sleeve tops. I re-hang the clothes on consistent hangers – for jackets and tops, they can be plastic, wood or plastic tubular. Pants and skirts go on hangers designed for them. But, again, make sure the two sets of hangers are the same! This is key! Using consistent hangers will allow the clothes to slide easily on the rod. You can get a lot more in the closet too. If you scour your favorite thrift stores, you can probably collect consistent hangers at a very reasonable price. Re-hang all the clothes by category, donating items that are no longer worn. Step back and love the new closet. My SIL wrote: I’ve been meaning to thank you for our Christmas gift! It was so, so funny how it all went down. First, I thought that you must have lost your mind for sending so many hangers. Then I thought, oh my gosh, she’s WAY more fussy then I ever THOUGHT of being! How is that possible? Nathaniel and Becky (her kids) said, why don’t we just do the coat closet and see how it is? Well, let me tell you – it looked sooooo much better that I went to EVERY closet in the house and reorganized and got rid of and eliminated and changed it ALL to your wooden hangers. Now I stand in the closets and gaze upon the difference it’s made! What an unexpected boon to experience! So, after all the jokes and speculation and surprise, I thank you for the extra touch that revolutionized my orderliness. I’ll never go back! Nope, no more riff-raff for the likes of me or my closets! It’s crazy what a difference it made! Our poor shoulders…they are our most amazing joints, but we tend to take them for granted. Take a few moments to think about how useful our shoulders really are, and how important maintaining their function is to our independence as we age. This is food for thought for all of us who are middle-aged, on up. Some attention is paid to our other main joints, such as our hips and knees, as we age. But think about all the day-to-day things we do with our shoulders – we reach, push, pull, pick up. Our shoulders move our arms up, forward, back, to the side – across our chests or out in any direction. Shoulder muscles are even indirectly involved in turning your head (very important if you are still driving). Shoulders are truly amazing joints, but we need to keep them moving! Neglecting our shoulders can greatly affect our ability to manage our daily tasks, which affects our ability to maintain our independence. We need good shoulder function for dressing, grooming, showering, navigating up steps, doing household tasks – just about everything. Let’s do a brief primer on the marvelous SHOULDER: it’s the most complicated and flexible joint in the human body and has the greatest range of motion. It’s comprised of three bones – the shoulder blade, the collar bone, which is joined by a ball-and-socket joint to the upper arm bone. The shoulder joints (actually a total of three joints each) are surrounded by cartilage, muscles and tendons to support mobility (range of motion, reaching) and stability (strength for pushing, pulling, lifting). The downside of this great range of motion of the shoulder is that for this joint to be this moveable, it’s inherently more unstable. Shoulders are vulnerable to injury, particularly in a fall. So what can you do to maintain good shoulder function? Start by asking your doctor if you are safe to do some simple arm stretches, and you then have a number of options going forward: you can join a stretching class, a water exercise class, a chair yoga class, you can work out with a personal trainer who works with seniors, or just do simple exercises on your own. There are classes on television and there are a lot of resources online, including YouTube video exercises that you can follow along with (have your grandchild set it up!). 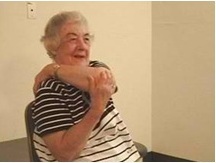 Other online resources for shoulder exercises are www.eldergym.com and www.seniorfitness.net. There are also video exercise programs, such as Wii, including a bowling game. 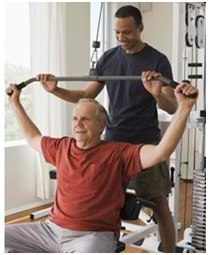 But most of the things you can do to increase your shoulder function are just in the course of everyday activities. And you can do reaches and stretches anytime, including on a daily walk or sitting in a chair. In addition to maintaining the number of activities you can do AND maximizing your independence, you will be helping to prevent or relieve arthritis pain, encouraging blood flow (including to the brain) and gaining some valuable cardiovascular benefit. Shoulder on!!! Hint: As you develop a program to strengthen and limber your shoulders, it’s wise to at least receive initial help from a professional, as doing an exercise improperly can also cause pain or damage. It’s important to exercise not only the front muscles of the chest shoulder and upper arm, but to strengthen the muscles in the back of the shoulder and around the shoulder blade. Michele Boudinot is a Credentialed Professional Gerontologist and a Certified Care Manager. She owns North Bay Eldercare Options, an eldercare consulting and care management company, and has worked with and advocated for North Bay seniors for over 30 years. You can reach her at (707) 766-6333 with any aging or eldercare questions. Do you have a loved one with a memory deficit or dementia who you feel you cannot communicate or connect with? Someone with whom you used to communicate regularly but who now cannot find all of the words or remember names/recent events? Someone who ruminates over things and says they feel lost or worthless? Someone who you deeply want to connect with but feel all the methods you have tried are useless? Nothing is more difficult, especially in a close relationship, than seeing big changes in your loved one’s cognition, and not being able to communicate the way you used to so easily. However, there are special techniques you can learn to create a new language of affinity with your loved one and restore some harmony even in the later stages of dementia, including Alzheimer’s disease. There is nothing more encouraging and rewarding than creating a personal connection, and seeing a shine in their eyes, a smile on their face, and a feeling of recognition from your effort to connect. As a Professional Activity Director for the past ten+ years (and more recently a Social Worker), it has been my biggest honor to learn what “turns on the switch” for each individual with memory loss with whom I work, and to see the rewards of creating more moments of recognition and alertness, for however long they last. I have learned that by understanding each person’s own language and past interests, more moments of harmony can be created for the memory-impaired individual, and their care takers. 1. Learn to appreciate the person as they are. Your loved one with memory loss or dementia is still the amazing, wonderful person you have always loved but has a brain disease and needs lots of your compassion and patience. It is not the person but their disease that has them forgetting things, so if you can meet them where they are in the present moment, go with the flow of what they are thinking without correcting them, and have compassion instead of arguing about their ways of seeing things, you are doing them a huge favor and letting yourself become comfortable with their process. 2. Get all the information you can!! If you are family you can learn from your loved one’s neurologist about what stage of memory loss or dementia they have and suggestions for treatment or support. As a family caregiver or friend, you can also go to the Alzheimer’s Association website, office, call their hotline, or go to their office, to learn about all levels on memory impairment, symptoms, and effective communication methods. They have an annual education conference each year also, and wonderful caregiver trainings. Also, contact Redwood Caregiver Resource Center for information, respite, and care manager/placement resources if needed (look-up on-line for closest office). 3. When you come to see them, use a warm and caring voice and gentle knock at the door to let them know you are there and meet them at their eye/height level. Tell them your intentions and be prepared to remind them who you are. (As an Activity Director I ALWAYS wear a name tag and remind each person who I am and why I am there). 4. Learn about and/or focus on what this loved one used to enjoy and create SOOTHING environments/activities to engage while creating a new language of affinity. I used to have a client who loved Dixieland Jazz and was from Louisiana, and also loved dancing and traveling in her younger years. She also had challenging behaviors when I saw her. For example, she would sob frequently and say “I am so confused” and then ask, “what is your name”? So, when I would see her I would use the techniques above to introduce myself and what we were going to do EACH time I’d visit, and if she asked again in the same visit I would reply as if it was the first time. Then for one activity, I would play the music and lead some gentle exercises (per my certification in senior exercise), and meet her right in the present moment with her love of music and dance. I would then bring in a picture book from the library about Louisiana and connect with her about her favorite place (sights, tastes, highlights), and use some fun trivia that would have her using her intact LONG-term memory and her joy for what she loves and we would reminisce and have brain games that she really enjoyed. We could also sing along to songs of Louisiana and I would share about my travels. I would ask how she felt at the end, and she would just beam with a huge twinkle in her eye and smile on her face, and say she was good, and I knew that this was the best language to speak with her. From this, she learned to associate my visits with harmony and respect, as well as fun and engagement, and we created a new language of affinity that met her in the present moment. Even though she forgot I was there the day after I came, and I had to remind her the next time who I was, her family said that my visits helped her enjoy most of that current day, and soothed her otherwise agitated mood for a while, which was a priceless gift. There are many other ways to create connection, but learning to be present; going with the flow; focusing on redirecting with music, movement, and activity can all bring joy and relief to the moment! Diana Gruhl, MSW, QAD, CSFL, is the Owner and Business Director of Elder Active Programs, bringing memory stimulating activities and exercise programs to individuals and groups in private and Residential Care Homes. She and her staff are trained to provide customized care and activities for seniors with memory loss and other health conditions. Call today for a free assessment at (707) 481-5959! Many seniors who have lived their whole lives being productive, purposeful, and engaged with others can become depressed and debilitated when they lose their independence due to illness, loss of work, or functional ability (Borg et al., 2006). Especially if they are not able to take care of their own needs; have poor health; and have low educational, socio-economic support, or social capital, they can become devastated by the factors of their lives and feel great despair (Borg et al., 2006). The impact of increased frail health and lower quality of life due to limited finances and social neglect can make them feel incapacitated, incompetent, and unable to see their value in daily life. In addition, senior isolation is usually caused by lack of connection to close family members, who are considered to be the closest source of intimacy among this population (Mullins et al., 1996). Seniors have a need for social relationship support in their older age to provide expressions of empathy, love, trust, and caring, as well as instrumental help, informational support, and appraisal, which are expected to be a function of the family (Ashida & Heaney, 2008). However, in modern times, many seniors live alone, due to the death of their life partner or due to a lack of nuclear or extended family systems, and may live in low socio-economic circumstances without support (Ashida & Heaney, 2008; Hashimoto, 1993). In response to this crisis, social relationships with friends, volunteers, and other society members are necessary to enhance the quality of life for the elderly (Ashida & Heaney, 2008). Social relationships help with the maintenance of good physical and mental health, while providing a network of support (Ashida & Heaney, 2008). These networks depend on reliability of network members, frequency of contact with members, and geographic proximity to network members to provide social connectedness, support, influence, and social companionship (Ashida & Heaney, 2008). They are also needed to buttress or complement the support that family members may not be able to exclusively provide, such as empathy, love, trust and caring, instrumental support or aid, informational support, and appraisal (Ashida & Heaney, 2008). Social support also helps with well-being and self-esteem and influences people to engage in more healthy behaviors while buffering life stresses. This, combined with home visitation, is one way to serve seniors and society, by supporting their wellness and mental health. According to the Activity Theory of Successful Aging, activity participation is an essential determinant of life satisfaction, fulfillment, and health among senior citizens, aged 65 and older (Onedera & Stickle, 2008). This theory states that regular involvement in social and cognitive engagement can help elders maintain their health and wellness, while improving mood, memory, and overall functioning. Specifically, the most beneficial activities suggested by this theory are those that positively impact seniors and others, such as sharing life stories with children and volunteering, engaging with social support systems and meaningful relationships, staying in touch with the present moment by learning about current events, having short- and long-term goals that give them meaning, and taking time for reflection (Onedera & Stickle, 2008). In addition, a Japanese study confirmed that seniors who are involved in a regular social support group have higher levels of functional capacity, increased self-esteem, and enhanced morale, which is associated with recovery from disabilities and slower declines in health, than those who do not participate in activities (Kondo, Minai, Imai, & Yamagata, 2007). These findings are critical as they demonstrate the essential need for seniors of all health conditions to participate in activities, in order to enhance life satisfaction and counteract the negative effects of aging (Kondo et al., 2007; Onedera & Stickle, 2008). Although most activities are beneficial, each senior population requires a certain type of activity to meet their particular needs. Research suggests that active community-living seniors benefit from more engaging, cognitively stimulating, and in-depth activities, such as mentoring a child in school subjects or teaching a person English as a second language (McInnis-Dittrich, 2005). This is due to their motivation to maintain their active cognitive status, good health, memory, and independence for as long as possible. In addition, the most beneficial activities for homebound seniors include meaningful conversations and discussions with younger persons where they can reminisce and relive memories, share their skills, experiences, and wisdom, and learn about another person. This is due to having increased needs for social support and memory stimulation, and less physical capability for external activities. Reminiscing about the past is an intensively engaging activity that provides a sense of accomplishment, showing that they can engage in dialogue about meaningful memories and counteract the negative feelings associated with potentially poor physical health (McInnis-Dittrich, 2005). It is also a way to increase feelings of competency and adaptive skills, as focusing on past memories recalls strengths from the past that might not be present if focusing on current problems. This activity is also helpful for youth who participate, since students who engage in the reminiscence process learn about life stages, the process of aging, life in different generations, respect for the elderly, and the growing field of elder care (Neysmith-Roy & Kleisinger, 1997). For more frail seniors, beneficial activities include hearing the paper read out loud, trivia, mentally stimulating games, chair exercise, cooking, listening to music, or going to events or concerts that they enjoy. This is particularly appealing if they lack transportation and other means to engage with the larger community; it not only provides intergenerational stimulation, but also access to activities from their past in which they might not otherwise participate (McInnis-Dittrich, 2005). Other activities include functional support such as helping with shopping, cooking, or crossing the street, all of which can be neglected or overlooked by busy family members, and therefore be of great assistance to the whole family unit (McInnis-Dittrich, 2005). The activity theory also states that challenging one’s cognitive functioning is a great way to maintain memory, which is a goal for frail as well as active seniors (Onedera & Stickle, 2008). This can be met by participation in this variety of activities and benefits all participants involved, while being of critical importance to senior health and well-being. Lastly, seniors with memory challenges benefit from activities that engage their long-term memory recall and feelings of well-being (McInnis-Dittrich, 2005). The best activities for this purpose include musical stimulation and reminiscence activities, because even though many of these seniors are “no longer able to orient to time, space, or person” and have limited cognitive functioning, they can respond to music (McInnis-Dittrich, 2005, p. 188). Specifically, those who have Alzheimer’s disease, who can experience a significant decrease in mainstream verbal communication, benefit from the utilization of instruments, sing-along programs with their favorite music, reminiscence about the past, and multi-sensory engagement; this provides a new language that opens doors to perception and enhances the present moment. Furthermore, recalling old songs, keeping rhythm and remembering words also focuses on the strengths of what they are able to do, instead of focusing on what they can no longer accomplish. In addition, these elders can enjoy arts and crafts projects that stimulate their minds with colors and shapes, as well as gear them toward the seasons, which helps orient them to time and space. Also, pet visits can be very nurturing for this population as they can meet their needs for touch, while enhancing communication with others (McInnis-Dittrich, 2005). For senior citizens of all ages, it is clear that social support and activity engagement provide significant benefits, including increased life satisfaction and fulfillment, memory improvement, and depression reduction (Ashida & Heaney, 2008; Borg et al., 2006; Bullock & Osborne, 1999; Mullins et al., 1996; Ron, 2004). References listed at the end of complete Master’s Thesis manuscript, “Adopt-a Grandparent Plus Program: A Grant Proposal Project”, by Diana Gruhl, MSW. Recently several local women have started businesses providing downsizing services for elders. Usually, these services provide consultation about what to keep and how to arrange things in the new place, but they do not do the actual packing and moving. Sub-contractors are hired to perform those services. Often these women have started their businesses shortly after providing services to an elderly relative and attending a couple of weekend seminars. My service is different in that I am “on the job” from start to finish and participate in the pack and move activities. I have had many years experience helping people with physical and cognitive disabilities relocate and have been very successful with them. 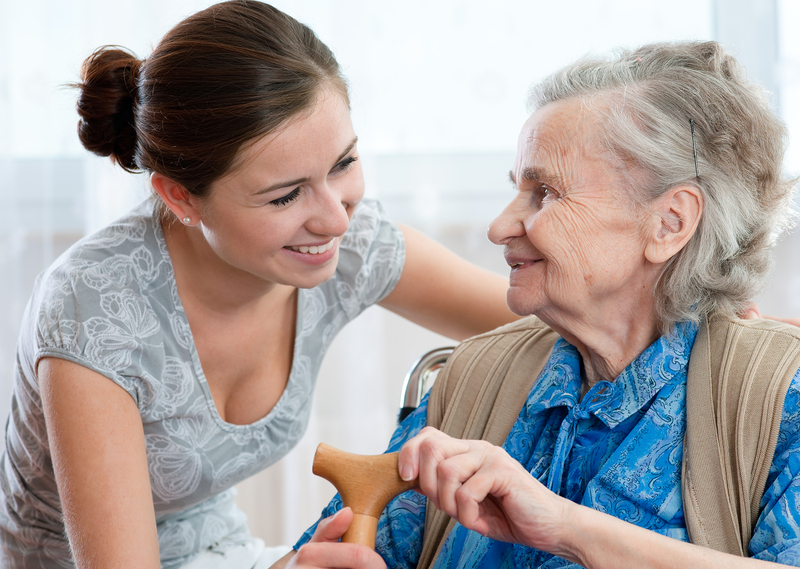 The ability to relate effectively with the elderly client and the primary care giver is very important in a move of this nature. In a small move (one or two rooms), we rent a truck and hire a laborer for help. On larger moves, I recommend that the client hire professional movers. If the client desires, I can make arrangements for movers. On moving day all items have been staged according to destination. I workwith the movers to make sure the right things get into the truck and come out again. I advise against having the moving company pack. In all my cases, I have packed with help from my assistant or laborers when needed. I label all boxes and containers very clearly. I sort everything before it goes into a box and like things go together. Moving companies do not do this and, as a result, unpacking becomes a frustrating and time-consuming process. I can arrange to make small truckloads of deliveries of items to anywhere in the Bay Area. I recommend that large deliveries or valuable items be transported by professional movers. I usually participate with the client and family in deciding what goes and what stays. I prepare detailed floor plans for the new place. I measure everything before deciding to move it. I can also take care of turning off and turning on the various utilities. We do the complete set up in the new home: kitchen, bathroom, clothing, installing electronics, etc. I also do cleanouts at the old place. We usually arrange for a dumpster, sort everything and review all found paperworkand valuables. Anything with questions are presented to the client. We make it “broom clean” after disbursement of all items. My rate depends on the difficulty and length of the job. The longer the job, the lower the hourly charge.